Home / huawei / postpaid plan / promo / smart / smartphone / Get your Huawei devices with Smart Postpaid Plans and might win a Photo Printer. Get your Huawei devices with Smart Postpaid Plans and might win a Photo Printer. 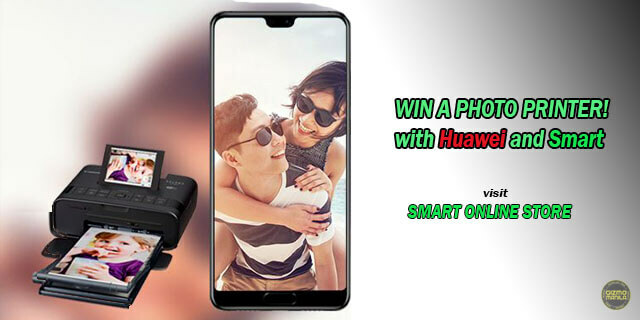 Smart, in partnership with Huawei, is delighting customers with a chance to win a brand photo printer with every purchase of any Huawei smartphone with a postpaid plan on the Smart Online Store at store.smart.com.ph. The official digital shop of PLDT's wireless arm, the Smart Online Store is a web platform that gives customers the ease and convenience of buying Smart products and services anytime and anywhere – on your desktop, smartphone or tablet – as well as dishes out exclusive deals, discounts, and freebies. This time, Smart Online Store customers who sign up for a Huawei smartphone bundled with an All-In Plan or a GigaX Plan until August 15, 2018 instantly earn raffle entries. The higher the plan, the more raffle entries earned. Smart Online Store makes it a lot easier for everyone to get a new smartphone with a Smart Postpaid Plan. To make a purchase, simply go to the Smart Online Store, select your desired smartphone and Smart Postpaid Plan from the menu and fill out the required information before checking out. Once your application is approved, you will receive a link for payment via email. Raffle entries will be credited to you after you settle your payment through its easy and secure payment options via MasterCard, Visa, ECPay, PayPal, Bancnet, LBC, SM, Cebuana Lhuillier, or Cash on Delivery. Aside from letting you buy the latest devices with a Smart Postpaid Plan, the Smart Online Store also enables you to track your orders, pay bills, renew or upgrade your existing plan, top-up with Smart Prepaid load, buy phone accessories and add-ons, among others. Stay updated on the latest exclusive deals and perks from the Smart Online Store by visiting store.smart.com.ph.